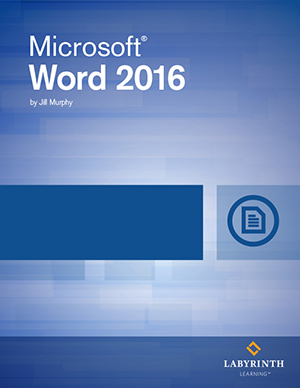 Microsoft Word 2016 Level 2: This intermediate level course book will build on the basics to expand students' MS Word skill-set as they learn special text effects, mail merging and the key tools essential to long documents. Students will be engaged with hands on learning as they apply learned concepts to create relevant, mock work examples such as a newsletter, table of contents and more. DELIVERY OPTION: This is the digital ebook only. Does not include printed textbook. Need your book immediately? Don't order the print book! If you order a print book, your ebook code will not arrive until the book arrives in the mail. For immediate access to the ebook, select the ebook only version. NEW FOR 2016: Lab Learning ebooks never expire! Our fully interactive eBooks deliver video, bite-sized content, integrated assessments and more to visually reinforce textbook concepts. That’s 0% Paper, 100% Brilliant. Instructors will save time and boost engagement! Experience the book the way your students will ... Digitally!